The Academic Bulletin contains information about Allegheny’s academic requirements and programs, including general graduation requirements and requirements for specific majors and minors. 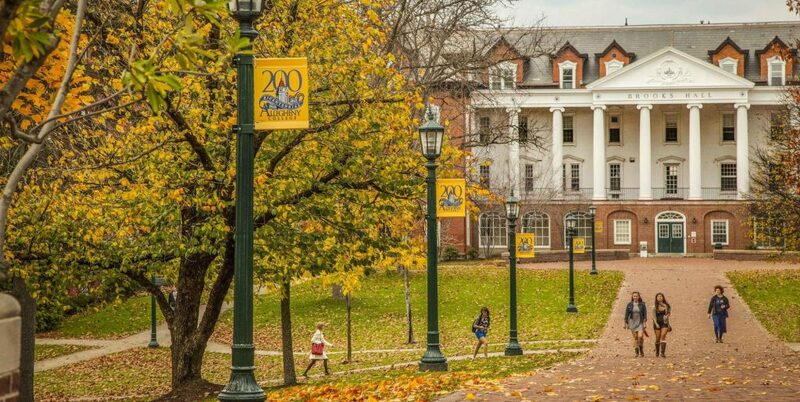 Students should be aware that they are governed by the academic requirements published in the Bulletin (formerly Catalogue) issued during the academic year in which they matriculated at Allegheny. Your academic advisor or the Registrar’s Office can assist you in determining precisely what requirements apply to you. Please see here for a list of changes published in the Academic Bulletin. If you are new to the online Academic Bulletin, use the “?” button on the top right to learn more. Browse topics using the navigation menu on the right. As a search term, enter one of the eight Distribution Requirement abbreviations in quotation marks: “CL”, “HE”, “IP”, “ME”, “PD”, “QR”, “SB”, or “SP”. To search within a specific department or program, select “Courses” and use the departmental rubric (i.e., POLSC) and the Distribution Requirement abbreviation in quotation marks (i.e., “HE”). If you have any questions regarding the online bulletin, contact the Registrar’s office at (814) 337-2357 or registrar@allegheny.edu. Please see the drop-down box at the top of this page to access archived Bulletins in web form.